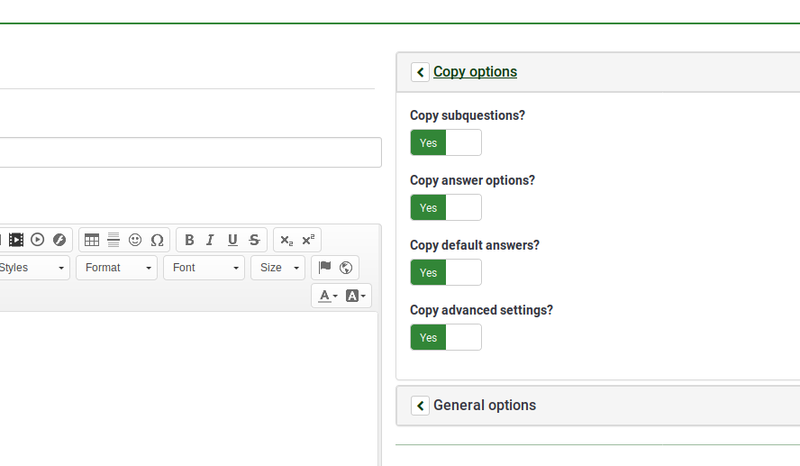 To quickly create (similar) questions, LimeSurvey provides you a functionality through which survey administrators can easily copy questions within the same survey. This tool is useful especially when you customize a few questions and you need multiple copies of them spread across your survey. The most important setting is represented by the question code/id which is highly recommended to be different than any other existing question code from your survey. Note: LimeSurvey accepts at the moment duplicated question codes. However, you may run later into problems when it comes to exporting survey data or if you wish to use expressions. Copy advanced settings? : if enabled, the advanced settings will also be copied. Note: By advanced settings, we refer to all the non general-related options such as: display options, logic options, statistics options, and so on. Each question contains different advanced options. For a comprehensive view of the capabilities of each question, continue reading the following wiki section. The options displayed under this tab vary in accordance with the selected question type. 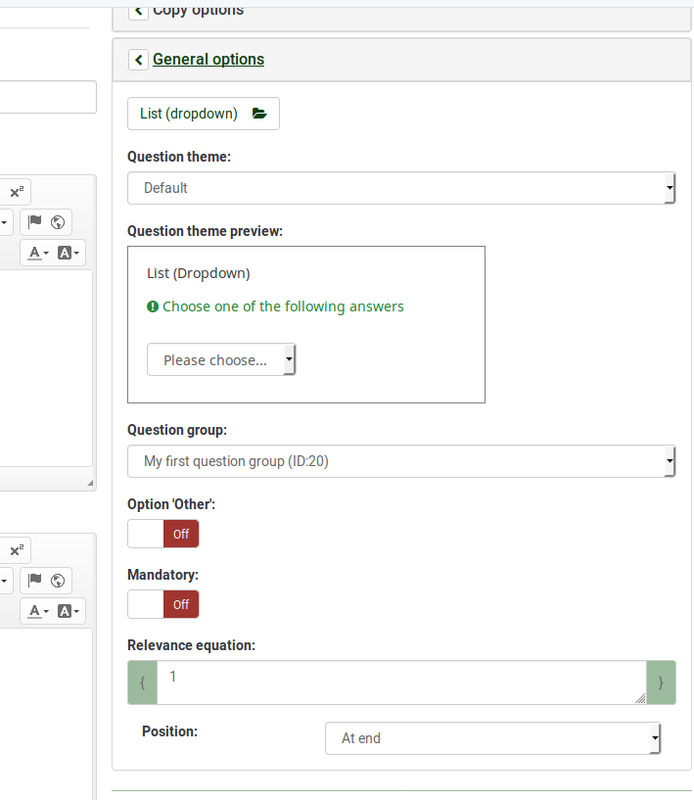 The only option that is unique is Position, which allows you to select the localization of the newly created question (see the last line from the above screenshot). 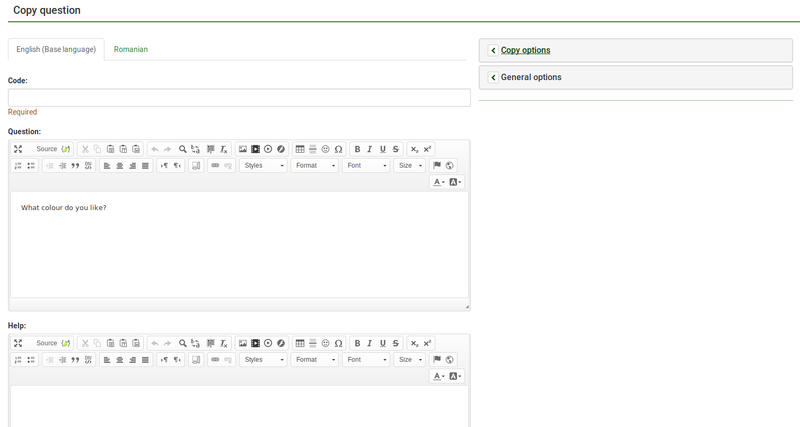 Once done, click on the save and close button located in the upper right part of the screen to copy the question. This page was last edited on 6 November 2018, at 13:23.